When you have a lot of Windows open on your PC, getting to the recycle bin can sometimes be a pain. 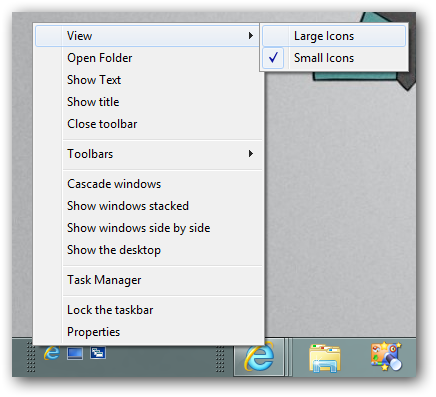 Use this quick tip to create a fully functional recycle bin in your taskbar. 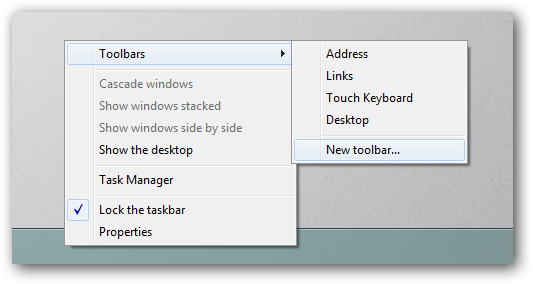 Right-click on the taskbar, and choose Toolbars \ New Toolbar from the context menu. You should probably also unlock the taskbar at this point. When you are asked to select a folder click on the navigation bar and paste the following into it. Once you are in the folder you can click the Select Folder button. You will notice that the toolbar is all the way over on the right, so click on the dotted lines and then drag the toolbar to the left. Note: In order for you to see the dotted lines your taskbar needs to be unlocked. Your taskbar should now look like this. The next thing you will want to do is get rid of the text, so right-click on the dotted lines and uncheck “Show Text” as well as “Show Title” from the menu. Now we need to make the icons bigger to do this, again right-click on the dotted lines, this time change the view from Small icons to Large icons. Now we need to drag the Recycle Bin from the desktop onto the toolbar. 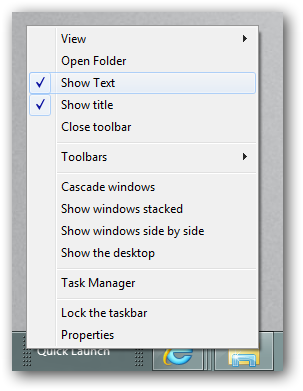 Finally we can delete the other shortcuts in the toolbar, then lock your taskbar again.